On February 27, the news site Mondoweiss published Ms. Cobban’s column on this topic. And this morning, Just World Podcasts released the 25-minute podcast take on the story. It starts with Ms. Cobban reading the column. Then, at about 12 minutes in, she continues by giving more background on the topic. The first “column” in this series, “The longer arc of US-Palestine relations”, was published on Mondoweiss, on February 20; and expanded podcast take on that was released February 22. 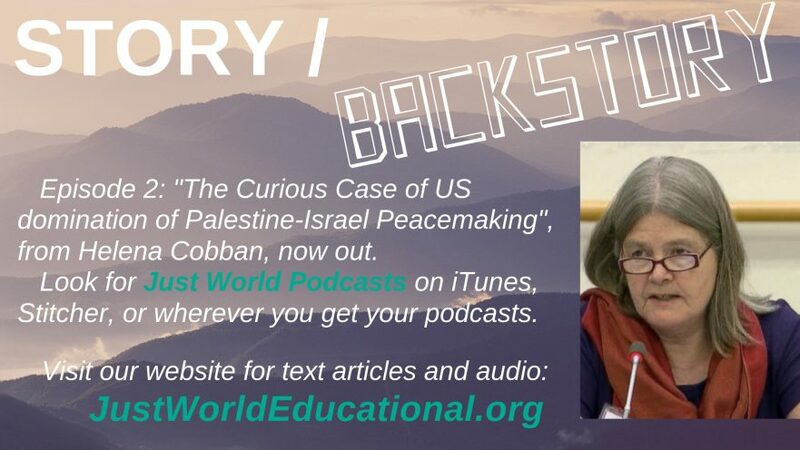 In this project, Ms. Cobban draws on her long experience as a writer and researcher on Middle East affairs to provide background to some of the most burning issues American policymakers and the public face in that region today. She noted that she’s particularly glad to partner with Mondoweiss for the publication of the text versions of the episodes, given that they have a lively, thoughtful, and well-moderated comments section on their site. We’re planning for the “Story/Backstory” project to run for an initial season of 13 weeks. You can read more about how it fits into the rest of our plans for 2019 in this recent newsletter.